"The House of War and Witness"
In the year 1740, with the whole of Europe balanced on the brink of war, a company of Austrian soldiers is sent to the village of Narutsin to defend the border with Prussia. But what should be a routine posting is quickly revealed to be anything but. The previous garrison is gone, the great house of Pokoj, where they're to be billeted, a dilapidated ruin, and the people of Narutsin sullen and belligerent. Convinced the villagers are keeping secrets - and possibly consorting with the enemy - the commanding officer orders his junior lieutenant, Klaes, to investigate. While Klaes sifts through the villagers' truths, half-truths and lies, Drozde, the quartermaster's woman, is making uncomfortable discoveries of her own - about herself, her man, and the house where they've all been thrown together. Because far from being the empty shell it appears to be, Pokoj is actually teeming with people. It's just that they're all dead. And the dead know things - about Drozde, about the history of Pokoj, and about the terrible event that is rushing towards them all, seemingly unstoppable. The ghosts of Pokoj, the soldiers of the empress and the villagers of Narutsin are about to find themselves actors in a story that has been unfolding for centuries. It will end in blood - that much is written - but how much blood will depend on Klaes' honour, Drozde's skill and courage, and the keeping of an impossible promise . . . It was “The Talisman”, the collaborative novel of Stephen King and Peter Straub, which made me consider such joint projects with great interest and fascination. Years later, I had the pleasant surprise of discovering a book written in three, “The Steel Seraglio” by Mike, Linda and Louise Carey. Of course, it was not only my curiosity for such endeavors, but as it was the case with Stephen King and Peter Straub’s “The Talisman”, my previous experience with Mike Carey’s writing was part of my attraction to this novel. Since “The Steel Seraglio”, or “The City of Silk and Steel”, as the novel was published in the UK, nothing much changed in my consideration for Mike Carey’s writings, I look at them with the same excitement, perhaps even with a little more. But it did change the list of authors I follow with interest adding among all those favorite writers of mine the team Mike forms with his wife and daughter, Linda and Louise. 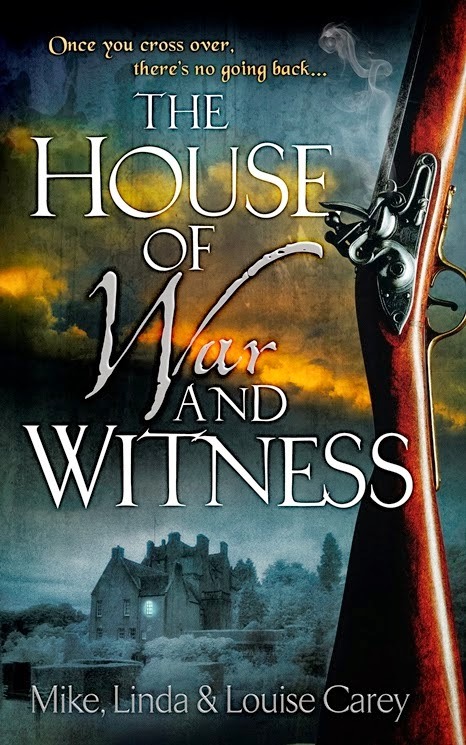 It wasn’t long before I welcomed another title from the said team, Mike, Linda and Louise Carey joined forces again and published a second collaborative novel, “The House of War and Witness”, two years after their first one. It is the year 1740 and following Maria Theresa’s succession to the throne of the House Monarchy war is looming over Europe. A small company of Habsburg soldiers is sent to the border with Prussia, next to the small town of Narutsin, as a precaution in the eventuality of war. Upon arriving to the great house, Pokoj, where they are billeted Colonel August and his company found no trace of the militia previously garrisoned here and are led to believe that the villagers of Narutsin are holding secrets. Colonel August assigns a junior officer, Lieutenant Klaes, to investigate the matter and to uncover the truths the villagers keep hidden. At the same time, Drozde, a puppeteer part of the company’s followers, protected by the quartermaster Molebacher, discovers that Pokoj, the house where they’re stationed holds some secrets of its own. An entire host of ghosts along with them too and Drozde will begin soon to learn most of their stories, some of them with consequences on the company’s presence near Narutsin and the Prussian border. The Careys place their new story on the brink of the first Silesian Wars in a village at the border of Austria with Prussia, but it is not the historical event that takes precedence within “The House of War and Witness”. They do capture some of the atmosphere, to the village are given nice specific details, the villagers are caught in a situation where survival is more important than the official delimitations between countries, the distinct company’s life, with some characteristics of the Austrian army at the time, such as the presence of soldiers gathered from all the empire’s corners within the company or the shadow of the recent defeats against the Ottoman Empire still weighting on the minds of the officers and troops. But it is the story of humanity and human beings at the core of the novel. A tale of the shining moments and the ugly face of human behavior, of best and worse in human nature, of selfish and selfless acts. Every emotion from joy to tears is captured within the pages of “The House of War and Witness”. Mike, Linda and Louise Carey’s novel is seen through the eyes of two major characters, Drozde, the gypsy puppeteer, and Lieutenant Klaes, the junior officer of the company, masterfully built in a stellar characterization. As a matter of fact, I find Drozde to be one of the best fictional characters I’ve encountered in my readings. And it is such a rare sight in fantasy genre, a female character portrayed strongly and vividly, as Drozde is, it is unfortunately an uncommon treasure. It is very true, the Careys have done it before with the impressive, powerful cast of “The Steel Seraglio”/“The City of Silk and Steel”, but with Drozde they matched and topped extremely well that performance. With Drozde they conquer every little piece that makes a character, there is a solid groundwork behind this personage to be discover scratching the shallow perception of others. At the first glance Drozde is just one more woman of the ones with easy virtues following the company, but she is certainly more than that. She is a strong survivor, pragmatic and talented, a craftswoman with unique abilities and qualities. Drozde is also tough, but without losing any slice of her compassion. One of the most memorable characters of my readings. Lieutenant Klaes is an oddball within the army corps, inclined more towards intellectual reflection rather than mindless action required from his superiors, Klaes is often caught between his principles and his training. Conflicted and uncertain at times, Wolfgang Klaes doesn’t come as fully rounded as Drozde at first, but grows with each new chapter until he becomes another strong presence within the story. As are all the other characters of “The House of War and Witness”, from the ones that have an important presence in the tale to those with the flimsiest of appearances. This ability to transform each and every single one of the characters into powerful, meaningful appearances demonstrates the potent ability of Mike, Linda and Louise Carey to instill life in the entire cast of the novel and make it believable to the smallest of details, proving they are master puppeteers, as is their leading character, Drozde. There are plenty of examples to be had, but in order not to stretch the space of this review too much let’s look at Lieutenant Tusimov for a bit, a character with something to say within the plot, but with only occasional appearances. It is a paragraph that showcases the treatment received by the personages of the novel even if their importance in the outcome of the story has greater or lesser significance. Taken individually each major or minor character is represented lively and vividly, but it is not only from here their authentic portrayal draws energy, but also from the excellent interaction they have with the other. The relationships and contacts made by various characters of “The House of War and Witness” are sturdy, making all the scenes feel natural. It is yet another demonstration of the authors’ ability of making their cast perform as seen in the most exquisite theatre plays. The story of “The House of War and Witness” starts and develops slowly, it takes a little time and several chapters to get it going. It is not a critique, the Careys create ambiance and lay the foundation for the plot to unravel in a pleasant and captivating manner. The story moves at a foot’s pace in the beginning but it does so without stranding the reader to a forced march, it carefully constructs an interesting and mysterious plot. Even more, it insidiously crawls in the reader’s mind and soul until the registration of the plot unraveling is felt with every fiber. As it was for me chapter 27, for instance, the moment in which the point of the story that comes with the most emotional and effective impact. The story gathers speed constantly and gradually until it becomes a breathtaking run toward the final outcome. There is another element within “The House of War and Witness” that in the onset it appears to stray away from the main plot, Drozde discovering the ghosts of Pokoj and the ritual of listening to their stories seems at first detached from the essential story line. However, it proves to be just an impression, the significance of the stories is uncovered at the time when it connects perfectly with the entire plot. All the pieces involving the ghosts of Pokoj fall in place at the right moment, rendering credibility to the way the story unfolds. There is another aspect resulting from this side of Drozde’s tale, nobody is the owner of the universal truth within “The House of War and Witness”, there is no heaven or hell beyond the ones created by the human beings. It is also part of the comforting zone of the novel, Mike, Linda and Louise Carey’s book is very dark, but it is balanced nicely with the brighter elements. After all, we cannot have light without shadows and shadows without light. “The Steel Seraglio”/“The City of Silk and Steel” was a delightful novel, a cracking parade of a powerful team of writers. With “The House of War and Witness” the teamwork of Mike, Linda and Louise Carey becomes stronger, their joint efforts coagulated even more. It leaves me wondering what their next collaborative novel would look like. Oh man, I very much want to get my hands on this book when I can! I really enjoyed "The Steel Seraglio," and I want to see what else the trio can do! Plus this sounds in general like it'll be an interesting read! I loved "The Steel Seraglio" too, but I found "The House of War and Witness" even better. But both these novels have a special place in my personal library. I do hope that the Careys would write another novel together.